A former Eurovision participant qualified together with nine other acts after a long and interesting night in Bucharest. Next week they will compete in the final of Selecția Națională, Romania’s national selection for Eurovision 2017. 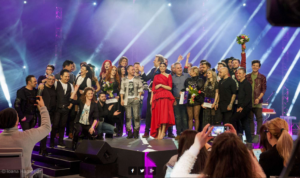 After the jury picked 15 semi-finalists out of more than 70 competing entries, it was again up to the jury to decide which 10 acts are going to compete in the Romanian final next Sunday. Then, televoters alone will have the right to choose the entry for Kiev. The band Elizé & No Stress opened the show with an alternative pop-swing track which enlarged the musical diversity of the evening, without being very popular among Romanian Eurofans. The jury described the entry as well produced and solid. In her second attempt to represent Romania at the Eurovision Song Contest, Cristina Vasiu this time competed with a radio-friendly pop ballad. Swedish producer Jonas Thander, who worked on Donny Montell’s entry for Lithuania last year, created the track especially for Eurovision. Musical professionals among the jury appreciated especially the emotional vocals of the artist. Tudor Turcu is a very familiar name to Romanian Eurovision fans, participating for already the fourth time in Selecția Națională. The former X-Factor winner competes with the rock song Limitless which is true to the music he usually composes. Nevertheless, the jury criticized him harshly due to the lack of power and attitude. After not qualifying to the semi-final last year, Ramona Nerra came back with vintage pop song, which conveys much energy and power on stage. As expected, her vocals clearly elevated the song and made her performance memorable and interesting. The Romanian language ballad mainly relied on the great chemistry which the young artists of the duet Instinct transmitted on stage. Very strong vocals and an authentic interaction between the two singers gave this song an emotional athmosphere. Eduard took part with a very alternative, almost indie-rock sound. It clearly brought a new flavour to Romania’s semi-final, working as a strong contrast to the other acts. The jury had only positive comments on the track, pointing out that it might be to avanguarde for a competition like Eurovision. Tavi Colen & Emma competed with an up-tempo Europop song which almost reminded the audience of the Eurovision Song Contest in the early 00 years. The music professionals described it as very predictable and seemed not to like the entry. Another alternative pop song, which further contained of rock passages during the chorus. Live, the singer visualized the song, putting herself in the position of a marionette. The jury members liked the originality of the song and the show. Fans favourites Ilinca and Alex Florea managed to meet the high expectations and showed a very entertaining performance on stage. As the title reveals, the song contains yodeling part within the chorus, combined with rap. Nevertheless, the track still has a mass appealing sound and has the important quality of being an earworm. A very traditional ballad which had the sound of being from another era. Music professionals from the jury did not appreciate the song very much, but liked Alexandra’s strong vocals. Boy band Maxim has charted in Romania for several times already and now attempts for the first time to represent the country in the contest. Adu-ți Aminte is a mid-tempo pop song which seems more suitable for radios than for the Eurovision stage. Even though it is modern, the track does not really build within the three minutes and therefore looses a part of its energy in the end. The band competed with mid-tempo pop track which contained the names of various European countries in its lyrics. Musically, the track did not really build during the three minutes and seemed not to be the audience’s favourite of tonight. Mihai represented Romania back in 2006 with the entry Tornerò and placed fourth. This year the vocalist tries to make it back to Eurovision with the traditional ballad I Won’t Surrender. The track is carried by Mihai’s strong vocals which give it a lot of energy and power. Spune-mi tu, an English-Romanian rock ballad also seemed to be from another musical era. The jury members felt reminded of their youth and positively reacted to the vocal abilities of the artist. In her second appearance in Selecția Națională, Xandra can be considered as one of the fan favourites. Walk On By is an atmospheric pop ballad, which is elevated by the attitude and the strong vocals of the singer. The professional jury had only positive feedback for the vocalist, underlining the strength of Xandra’s voice. In the beginning of the event, every artist entered the stage with a cover of a famous Eurovision entry. Then, the two presenters Iuliana Tudor and Dan Helciug, welcomed the audience and introduced the professional jury. In the following part, the acts performed their entries on stage. Ovidiu Anton, last year’s selected contestant for Romania, joined as an interval act with his new band ANTON. 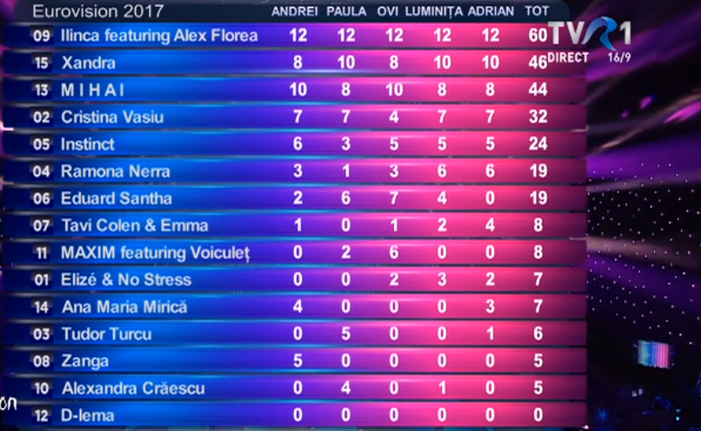 Ana-Maria Mirică had the same amount of points as Elizé & No Stress and qualified due to the biggest note of 4 points. In 20 participations, Romania managed to reach the Top 3 of the competition on two occasions. Luminița Anghel and Sistem were the first to come third in the Grand Final back in 2005, when the contest was held in Kiev last time. In 2010, Paula Seling and Ovi also finished in third place with their entry Playing With Fire. As Romania was disqualified last year, the last appearance of the Eastern European country in Eurovision was in Vienna 2015, when Voltaj competed with the ballad De La Capăt (All Over Again). Below you can check out their Eurovision performance. Let us know your opinion on social media.